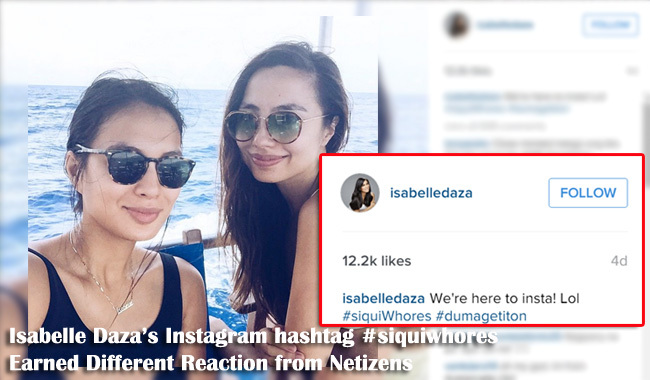 Netizens reacted on actress Isabelle Daza’s Instagram post with hashtag #siquiwhores. The actress wrote on her Instagram account “We’re here to insta! Lol #siquiwhores #dumagetiton,” on which many consider this derogatory during her trip to Siquijor with her cousin Martine Cajucom. Siquiwhores is a play of Siquijor, the province, and whore which pertains to prostitute. This did not sound good to netizens, especially to people of the said province. Because of this, Siquijor Vice Governor Dingdong Avanzado wants a clarification from Isabelle. His statement posted on his Instagram account says “I believe every citizen of Siquijor deserves a clarification from Ms. Daza on the matter.”The Vice Governor would like to know of the term “siquiwhores” refers to themselves or is it addressed to the people of the said province. While there are netizens who bashed the actress for her Instagram post, there are some who defended her saying that it is clear that the term siquiwhores refers to the two. Isabelle is yet to give her explanation the issue now that she is on hot seat. Because of what happened, there were few other celebrities who only left a short comment on the Instagram post. Let us look forward to what Isabelle will say regarding the trouble she is facing right now for her Instagram post. Isabelle Daza is a Filipina actress, model, and television host. She is the daughter of Gloria Diaz, Miss Universe 1969, and Gabriel “Bong” Daza, former Makati City Councilor.